My friend Ginny planted this tree in my backyard as a memorial to my parents. When Spring comes, despite the low temps tonight, the buds cluster and bloom all along the branches. It is a most beautiful tree. Soon the heart shaped leaves will appear. What a beautiful way to remember your parents. I love these trees. What a lovely memorial. That is one thing I do miss by living in Florida. The Eastern Redbuds showing their colors in the spring giving all the hope that “things come to life again” after a long winter. A beautiful way to remember your wonderful parents. Wow! Gorgeous! Spring has finally arrived! That IS a beautiful tree. Trees are a wonderful way to honor or memorialize someone you love. I like the way you captured the water droplets. Love this fabulous close-up. 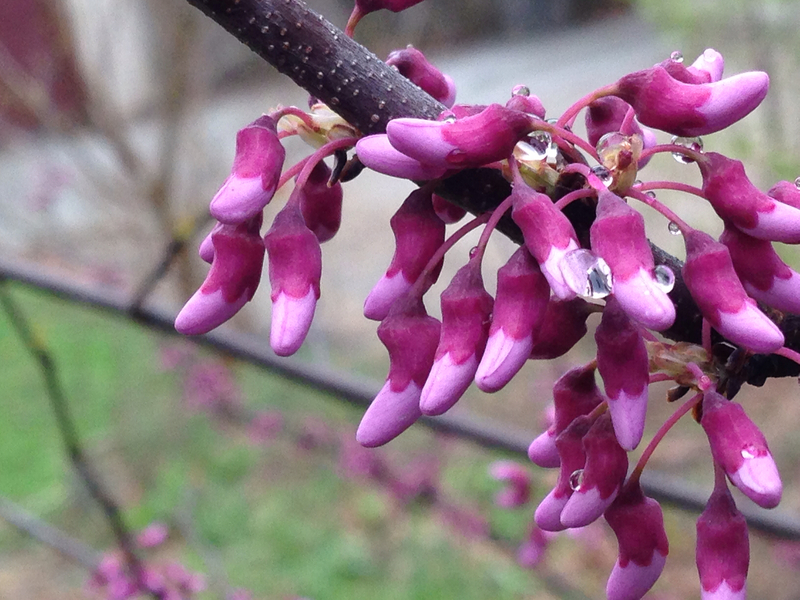 I tend to photograph redbud trees in their entirety. Next spring, I’m going to remember how gorgeous these blooms are up close! Beautiful, the buds look like fairy shoes. A fantastic tribute to loved ones who are no longer with us. A lovely plant, a lovely thought. A good friend. Hi Ruth. This looks like a little sock or bootie tree! Beautiful!